This film is a loose remake of ‘The Shaolin Temple’ (少林寺) which was released in 1982 featuring Jet Li in his debut role. 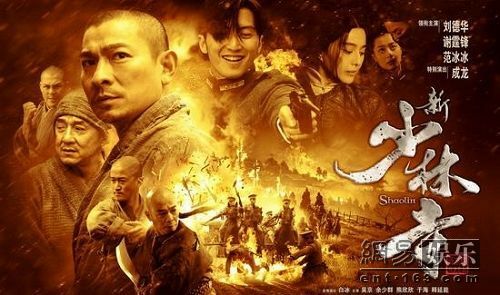 Verdict: This is like a combination of ‘Running on Karma’ (which also featured Andy Lau as the protaganist) & ‘The Last Samurai’. Impressive acting performance by Lau, notably for the fighting scenes, and for the emotional ones as well. The film itself, compared to the original, focuses more on Buddhism values rather than martial arts. There are quite sufficient action scenes but it lacks of comic relief; something that Jackie Chan was supposed to provide here, I believe. Certainly a film to avoid if you aren’t really interested in the whole Buddha/Karma stuff. Weird: Why does everyone in China here speak in Cantonese but the foreigners can speak in Mandarin? Or go for it if you want to sleep in the cinema. I watched! =D superb niceee!